The $99.99 64-GB SanDisk Media Drive is also available in a 32-GB version. The Media Drive is just one option in SanDisk's Connect line of wireless media. The 2.6-inch square unit has a tasteful brushed aluminum band sidewall and a faux weave black top. When you set it down it doesn't slide but grabs smooth surfaces. The back has a Micro USB 2.0 port, not unusual for devices in this class but nevertheless hard to connect (there's a right way and a wrong way). 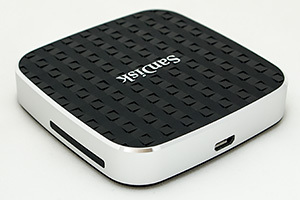 The right side sports an SD card reader with added functionality in the latest firmware release. In front is the power/reset button and three small LEDs to indicate Internet access, WiFi connectivity and Battery status. We're not fans of power buttons, preferring switches. On the Media Drive, holding the button in for two seconds powers the unit on or off while a 10 second press restores the Admin and WiFi passwords and a 25 second hold reboots the device. Considering how rarely you need the various reset functions that isn't much of a problem. SanDisk claims the internal lithium ion battery is good for eight hours per charge. The device is compatible with iOS 5.0 or higher, Android 2.3 or higher and Windows 8/7/Vista/XP or Mac OS 10.6 or higher. Media Drive. Note the SD card reader slot with a blank installed. Online SanDisk offers a User Manual for iOS and Android devices. It also provides a useful series of short videos. We do have to say we missed the 12-volt power adapter that came with the MediaFlair. That strikes us as more useful than another USB wall charger. SanDisk points out that the Media Drive (or any device of this class), you can share any WiFi access. So rather than pay a per-device hotel charge for WiFi access, for example, you can connect just the Media Drive and share that single connection among devices. The drill is the same. Turn on the Media Drive by holding the power button in two seconds. Wait for the LEDs to all light up. Tablet Setup. Media Drive selected. App Settings. Bridge mode enabled. Like all of these wireless storage devices, you must then go to your wireless device's Setup menu and switch from your normal WiFi router to the storage device. Once you've connected to the storage device, you can run its app to enable Bridge mode. In the Media Drive app that's called Connect to Internet. Turn on WiFi and Choose WiFi Network. The app only showed Wireless B networks. That's also where you would set up a password for the device. While connecting worked as advertised, we did have some trouble with iOS 7 connecting to the Media Fire at first. The app would report it couldn't find the device, so we'd have to go back to the iPad setup menu and try it again. To install a firmware update, you download it on your computer and copy the download to the Media Drive. Then you unplug the Media Drive from your computer to access it from the app on your mobile device, which sees the update on the drive and offers to install it. HTTP Access. 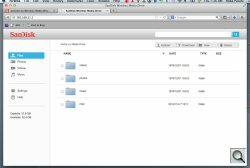 Safari see the Media Drive after firmware update. When you confirm that you want the update installed, it gives the command and the device is not accessible for a few minutes while the update is installed. The LEDs indicate the installation's progress. It's a pretty straightforward process, well-documented on the SanDisk site. We had no trouble at all. Version 2.9 of the firmware, released late in 2013, added both http access and file copying from card to the device. You can check for new firmware on the support page. The 15.8-MB Media Drive app operates much like the MediaFlair app. SanDisk points out that the Media Drive can serve any file format but will open only formats supported by your mobile device. Folders. Note status icons (lower left). Video Folder. Thumbnails from the SD card. The app has three handy status symbols in the bottom left corner. They report Battery Capacity, Available Memory in main storage and Available Card Memory if one is inserted. Files. Both card and internal storage. SD Card. A folder on the SD card. It behaves a little differently than the MediaFlair app, which seems to display everything within the app. Media Drive, in contrast, prompts you for an app to open various formats. So if you tap on a PDF document, it will ask you what app to open it with. It does seem to handle video and photos itself, however, offering a slide show option when you tap an image to view it. There are also a few photo editing options (Rotate, Enhance, Red-Eye, Crop). An icon in the lower left corner enables copying and sharing the image, although we weren't able to actually copy a JPEG anywhere. Photo Display. Copy options, too. When you click on a media type, thumbnails are displayed. The Files media type, however, lists the Media Drive's main storage as a folder and any card as another folder. That's how you get to the card. The app also includes some simple help from the Quick Start Guide. Help. Showing the unit's controls. Help. Showing the USB power adapter. The Media Drive seemed just slightly less polished in operation than the MediaFlair and we did miss the MediaFlair's 12-volt adapter. We're not sure why we couldn't complete a file copy from a card to the built-in memory, but we'll keep trying (and we did manage to do it, as we explain in the Conclusion). On the plus side, the Media Drive has quite a bit of permanent storage at 64-GB plus the immediacy of an SD card reader, so you're losing nothing there. There's no reason to think too hard about the Media Drive app's capabilities. WiFi setup worked fine and was simple enough. Handing files off to other apps makes perfect sense -- and that's why whatever limitations the photo viewer has don't matter much.